Due to the susceptibility of flare systems to flashback if not properly purged, a minimum continuous purge rate is required. Often in order to reduce the purge gas consumption, a purge reduction device is specified in order to prevent or limit air entry down the flare riser. Diode Seal: This velocity type seal is the simplest of purge reduction seals and takes the form of a truncated cone normally situated just above the flare tip inlet flange. It provides the flare system with a physical barrier to air penetration down the inside wall of the riser and also maximises the velocity of the purge gas in the open centre of the riser, further reducing the risk of air ingress. It is a simple cost effective method of purge reduction. Molecular Seal: This diffusion type seal is theoreically** the ultimate purge reduction device and is effectively a pressure vessel installed just below the flare tip. The seal is normally flanged between the flare tip and stack and is designed to prevent air from entering the flare system. The Argo AMS is a standard labyrinth type used throughout the flare industry and can be used with purge gases lighter or heavier than air. The difference in purge gas and air densities sees the purge gas form a molecular barrier in either the top or in the bottom section of the molecular seal. This prevents a combustible mixture forming in the flare stack. The vessel has an inspection port and a drain to allow trapped liquids to drain down the stack via a separate line. Typical construction is carbon steel and it is classed as a coded pressure vessel. **The molecular seal although theoretically the best performer with respect to purge reduction does have the disadvantages of significantly adding to the stack wind loading and the low flame velocity can lead to internal burning of the flare tip leading to more frequent flare tip replacements. This experience has lead to the more widespread use of the velocity seal. To eliminate the risk of flame lift off and maintain a stable flame on simple pipe flares at high gas exit velocities, specially designed flame retention devices of varying complexity should be incorporated at the top of the flare tip. They use either differential pressure or gas diversion to achieve reliable stabilisation of the flame and efficient operation in high winds. Angled Lugs: This is the simplest type. A set of angled lugs is positioned over the exit port and projects radially inwards towards the centre of the flare tip. Concentric Ring: This is a concentric insert built into the top of the flare tip and stabilises the flame by diverting some gas to the underside of the stabiliser ring where it is ignited by the pilots. The combination of this with the already ignited flame prevents flame blow off. Sonic Flare Lugs: Our sonic single point and multi point pipe flares have additional flame stabilisers fitted to each discharge nozzle. The jet nozzles incorporate lugs behind which are drilled gas bleed holes. In between the lugs a gas bleed hole is also drilled. This allows some of the flare gas to escape the nozzles and be pre-ignited by the pilots to give better flame stabilisation. Our flare tips include either a slatted wind shield or a slatted wind deflector system that are designed to eliminate the low pressure zone frequently created on the downwind side of flares. Elimination of this low pressure zone extends the operational life of the flare by reducing downwind flame lick on the main body of the flare tip. This thermocouple is located in a thermowell on the inner body of the flare tip and is used to detect internal burning within the flare tip. It is usually cabled back to the ignition panel together with any pilot flame detection thermocouples and a signal is provided to the client DCS via the panel. This is a vessel normally forming the base of a flare stack or located close to the base. It is designed to either protect the flare header from flash back or divert the gas flow to either a staged flare or from a flare gas recovery system to a flare. This is achieved by directing the flare gas through a seal usually formed by water. The depth of the liquid determines the system back pressure so in some cases it is also used to maintain a positive pressure in upstream piping. Anti freeze or alternative liquids are used when low temperatures gases are involved. 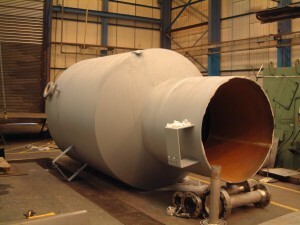 These are pressure vessels located within the main HP and LP flare headers. They are designed for the removal of condensate and entrained liquid to prevent liquid carryover and possible flaming rain. This is achieved primarily by increasing the flow area, thus reducing the gas velocity and allowing the heavier entrained liquid droplets to fall from the gas stream, into the base of the drum, where they are collected and disposed of. HP flare KO drums are normally designed to remove 600 micron diameter droplets and above. LP flare KO drums are normally designed to remove 300 micron diameter droplets and above. Flare stacks are usually fitted with caged ladders, step off platforms located 6 to 9m apart and a top flare deck (flare tip access platform) for inspection and maintenance purposes. A davit may also be located at the flare deck designed for lowering flare tips or parts such as pilots to ground level and lifting new flare tips and pilots. Depending on stack location, riser design temperatures, maintenance requirements and budget, the flare stack has various design types including guy wire, guyed derrick, derrick structure, self-suport riser and demountable. These are normally a bolted construction shipped to and assembled on site. Offshore flare towers or booms are normally a welded construction.